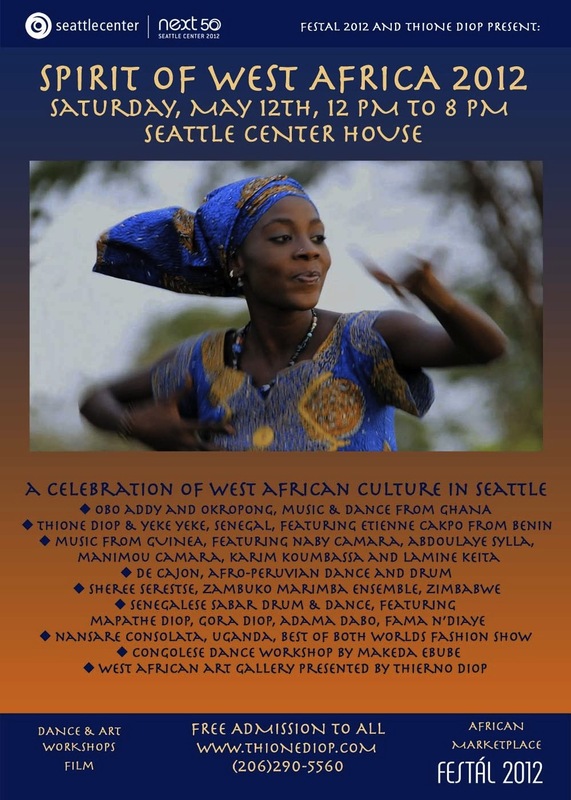 The Spirit of West Africa Festival is an extraordinary event that takes place at the Seattle Center every year. This festival, produced by local Senegalese griot musician, Thione Diop, showcases the sizzling talents of West African musicians, dancers, and artists in the Seattle area and from around the country and brings the community together to celebrate the rich culture and heritage of the West African people. Experience the joyful and colorful Spirit of West Africa through the rhythms, melodies and dance of our traditional performers, lively marketplace, gallery of ancient artifacts, films by African directors, African textile display, children’s Ashanti print making, and a fashion show where the beauty of Africans and their creative clothing is accompanied by the ancient rhythms of the drum. Feel and see the connection with the irrepressible spirit of the motherland as it is expressed in Africans everywhere.